NAIROBI, Nov. 16 (Xinhua) -- Abdi Nassir started his entrepreneur journey after graduating from a mid-level college in Kenya's capital Nairobi thanks to inspiration and mentorship from close relatives who followed a similar path and was rewarded handsomely. The 28-year-old businessman was in buoyant mood on Wednesday afternoon as he strolled along the elegantly decorated pavilion where the China-Kenya Industrial Capacity Cooperation Exposition took place. Abdi and a group of young entrepreneurs huddled together at the exhibition stand belonging to China's Hebei Pingle Group where they learnt about the inner workings of modern flour and wheat milling machines. "Am impressed by the cutting edge industrial machines being showcased in this expo particularly the ones dealing with food processing because that is the line I have invested in the recent past," said Abdi. He has been processing fruits for domestic and export markets but has lately toyed with the idea of venturing into flour milling given the huge profit margins that are guaranteed. "So far, am convinced that the flour milling machines from Pingle group are of high standards and am negotiating for a discounted price to enable me plunge into a business that is lucrative since maize flour is a staple in the country," said Abdi. The Hebei Pingle Flour Machinery Group was among dozens of Chinese companies that are showcasing their products at the four-day expo taking place in Nairobi. 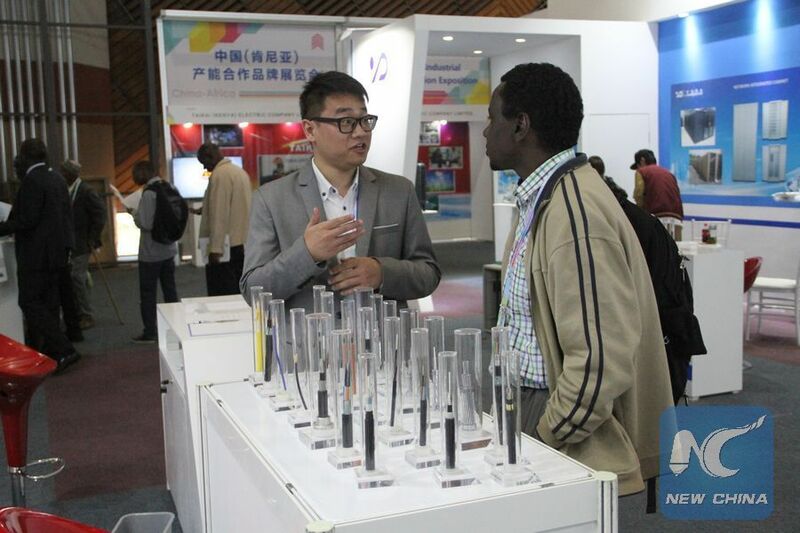 Candy Ren, marketing manager of Pingle group, said the expo has provided a platform for Chinese companies to explore the Kenyan market and forge long-term linkages with local clients. "Kenya is a potential market for industrial machines and we have already established a strong presence in the country. We have an office and a spare parts storage facility as we gear up for huge business opportunities," said Ren. She revealed that budding entrepreneurs who were impressed by the quality and user-friendliness of Pingle group's flour milling machines, promised to place an order in the near future. Kenyans from all walks of life trooped to the expo that showcased China's prowess in advanced manufacturing, which Kenya has been aiming for to accelerate economic growth. Ken Ng'ang'a, a middle-aged entrepreneur, visited Qingdao Foxxon Rubber and Tires Co., Ltd, where he inquired about the cost and durability of vehicle and motorcycle tyres on display. "The most impressive thing about this expo is that companies that have an international reach are participating. I have faith in tyres manufactured in China and have been stocking them in my hardware shops spread across Nairobi and nearby towns," said Ng'ang'a. He disclosed that he has visited Chinese manufacturing hubs like Guangzhou in search of quality but cheaper tyres for domestic and regional market. "I have been importing tyres from China and this expo came at the opportune time as I look forward to fruitful partnership with manufacturers who are participating," said Ng'ang'a. Henry Ren, general manager of Qingdao Foxxon Rubber and Tires Co., Ltd, said that participating at the expo was a milestone in his business career. "We are shopping for a local agent to facilitate our entrance into the wider eastern African region. In the meantime, Kenya remains our key target market given its robust economy and close trade partnership with China," said Henry. He disclosed that many Kenyans were keen to sample his company's tyres after discovering their quality was above board yet their cost was modest. "Our goal is to sustain quality of our products as we cement business relationship with Kenyans and hope to identify a local agent to help grow our footprint in this market," said Henry. The expo was a showcase of heavy industrial machinery, motor vehicle parts, electronic goods and solar lighting systems manufactured from the Asian country. Richard Tapatayia, an entrepreneur in transport business said that attending the expo was an eye opener since it exposed him to China's competitive edge in the manufacture of vehicle spare parts and industrial machinery. "It was exciting to learn that China is also advanced in motor vehicle assembly and came across exhibition stands where high quality vehicle parts were displayed," said Tapatayia. He expressed a desire to source for vehicle spare parts from China having been convinced that they meet the threshold in terms of quality and durability.